Word on the internet is that Microsoft is readying itself to launch the revamped Xbox 360 Elite games console in the UK. If the rumours are to be believed, it's going to hit the UK and the rest of Europe on 24 August and will cost 450 euros (£300). The information comes from Spanish minnow games site La Trifuerza , which claims that it has spoken to Microsoft employees who confirmed the above details. However, we contacted Microsoft in the UK and were told in no uncertain terms that, as usual, it doesn't comment on rumour and speculation. So the question is really: did a Microsoft PR person in old Espana let slip by accident? Or is this all a load of cojones? 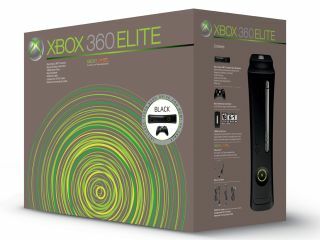 One thing's for sure, the Xbox 360 Elite will be warmly received in the UK when it does launch. For the extra cash - it'll cost around £20 more than the current premium Xbox 360 - you'll get a cool-looking black exterior, HDMI outputs on the back and a spruced up 120GB hard drive. What's more, the Elite is not plagued by many of the problems of earlier Xboxes, like over-heating and disc scratching. It would have been a lot prettier had it had Wi-Fi built in. And an internal HD DVD drive would have been good too. But alas. We'll just have to make do with a console that's every bit as good as the PlayStation 3 , but costs a full £100 less. Oh the pain.